Muslim Brotherhood Supreme Guide Mohamed Badie has refuted claims that the group's supporters initiated the attack on President Mohamed Morsi's opponents Wednesday in a deadly confrontation between the two camps where at least six protesters were killed. "We have eight martyrs and 1439 injured. All those who died [in Wednesday's clashes] are members of the Brotherhood. We also suffered the burning of 28 of our headquarters, apart from the Muslim Brotherhood's main Cairo headquarters. The headquarters of the Freedom and Justice Party newspaper has also been torched," he said. According to several eyewitnesses and videos, supporters of Morsi, who hails from the Muslim Brotherhood, marched on the palace and attacked a sit-in staged by dozens of opponents left over from a mass rally Tuesday at the palace. Rival mass protests have broken out in Cairo and other governorates over the past two weeks since Morsi's announcement of a constitutional declaration expanding his powers on 22 November. Several headquarters of the Muslim Brotherhood were reportedly raided by protesters. Several hundred protesters attempted to raid the central headquarters of the Muslim Brotherhood in the Cairo district of Moqattam Thursday night, following the deadly clashes Wednesday. Meanwhile, Islamist supporters are staging a sit-in in front of the High Constitutional Court and 6th October Media City. Many injuries among protesters were reported from birdshot wounds. Most deaths were reported from gunshot wounds. A number of protesters who were delivered to police by Morsi supporters say they were held and beaten by Islamists before being handed over to authorities. "If anyone has proof that we spilled blood, let him present it," Badie said during a news conference Saturday. He continued criticising the opposition for rejecting negotiations with President Morsi, which the latter called for Thursday in an attempt at damage control. Badie also protested the release of 139 anti-Morsi protesters. 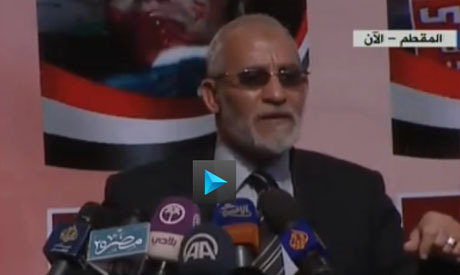 "Not one member of the Brotherhood was arrested bearing a weapon," Badie claimed. "I demand the prosecution recapture those released on Friday for they were caught red-handed," he added. Amid mass protests by opponents Friday across Egypt, Vice President Mahmoud Mekki announced that Morsi was ready to postpone a referendum on the beleaguered draft constitution scheduled for 15 December. However, the National Salvation Front, led by Mohamed ElBaradei, Hamdeen Sabbahi and Amr Moussa, rejected negotiations and called on Morsi to drop his constitutional declaration and postpone the referendum immediately. "Ask one of them, when he wanted one million signatures, who helped him gather 800,000 of them?" Badie said, referring to the 2012 petition for change championed by the National Association of Change led by ElBaradei, who now leads the National Salvation Front. Badie denied claims that he rules Egypt behind the scenes. "If I were the true ruler would it been have been possible to raid my office and sabotage my documents? How can I be the ruler and not be able to protect my own headquarters?" Badie added: "If the president was from another group, would he have gone on the street calling to oust the president? Of course not. The Muslim Brotherhood committed to dialogue even before the revolution. "Behind what is happening is not politics. It is certain interests and money that do not want any good for Egypt. "Ask General Assar (member of the erstwhile-ruling Supreme Council of the Armed Forces). Opposition groups wanted the military council to remain in power because they were not ready for a power transfer. They said only the Muslim Brotherhood was ready. "What is happening is a political competition. We have to defer to the ballot box. Let us compete with honour," Badie said. President Morsi met Saturday afternoon with a group of mediators in an attempt to resolve the current political impasse as dozens of protesters remained camped in front of the presidential palace. The MB has been subjected to massive media campaign against its image. Their buildings have been burned, they lost five or six supporters in the last few days. If Mosri were to be as vicious as Nasser, he would have put all his opponents in jail. He is just too nice. Also, if a church were to be burned, you would hear the pope crying across the globe for injustice. The church needs to get its thugs out of the streets. What was accepted by a Military coup leader 50 years ago is no longer accepatable today Period. The flulus, coptic and the far left foreign agents, are behind the current drama in Egypt. Allah will complete his light and place those thugs in their proper place.